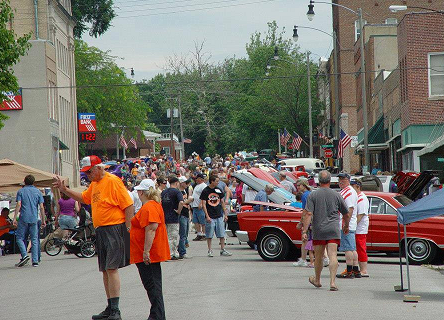 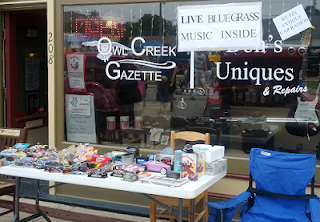 Second Street in downtown Greenville, IL ... filled with cars and people as folks enjoyed the antique and retro cars at the Graffiti Car Show on Saturday, June 15th. 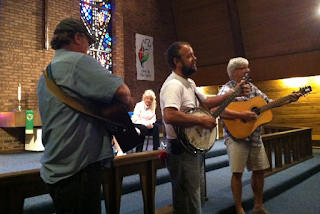 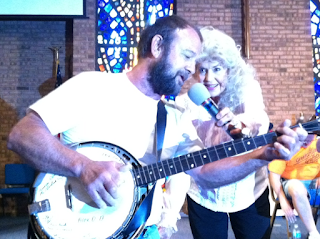 After entertaining us at the Owl Creek Gazette office, Swamp, Craig and Bob headed down to the Methodist Church on Second Street here in Greenville to play the "Elly May" song Craig had written with Donna Douglas (Elly May Clampett) in mind. Here the bluegrass trio play and sing as Ms. Douglas (Greenville Graffiti Car Show Special Guest) looks on. Here Donna Douglas (Elly May Clampett) holds the mic for Craig Baumberger as he sings his "Elly May" song for the crowd.